Boys and girls, here&apos;s a quiz for you. She is famous, well travelled, has been a Member of Parliament, and loves conserving our environment by planting trees throughout Kenya. Congratulations if you guessed right, she is... Wangari Maathai! She was born in 1940, the third child in a family of six children at Ihithe village, Nyeri District. Her parents were peasant farmers. Wangari started going to school at the age of seven. In her book, Unbowed, One Woman&apos;s Story, Wangari says, "I remember my first day at Ihithe Primary School as fascinating; especially now that I had a pencil, a slate and an exercise book all in a simple goatskin bag." Wangari later joined St Cecelia&apos;s Intermediate Boarding School. Then in 1956, she joined Loreto Girls&apos; High School in Limuru. In 1960, Wangari went to the United States for further studies. She first attended Mount St. Scholastica College, later winning a scholarship to Pittsburgh University where she pursued a Master&apos;s diploma in biological sciences until 1965. She returned to Kenya in 1966 to work as a research assistant at the University of Nairobi and two years later, became a lecturer. Wangari completed her Doctor of Philosophy degree (PhD) in 1971, becoming the first woman to do so in East Africa. She was also the first woman to head a university department in Kenya. Although a pacesetter, Wangari was hardly recognised in a male dominated world. Most positions were a preserve of men and Wangari had to fight for her place and those of other women. Wangari has been a voice for women and the poor. In 1990, she opposed the construction of a 60-storey building at Uhuru Park in Nairobi. Uhuru Park is a public park and putting a buildingon it would have denied the public a place to rest. The case was heard in favour of Wangari and the complex was never built. In 1992, Wangari showed her unity with the mothers of political prisoners who set up camp at Uhuru Park demanding the release of their sons. Police beat them and pictures of the mothers, chained together, were published in newspapers worldwide. In 1977 she founded the Green Belt Movement, aimed at bringing Kenyans together to plant trees and conserve the environment. 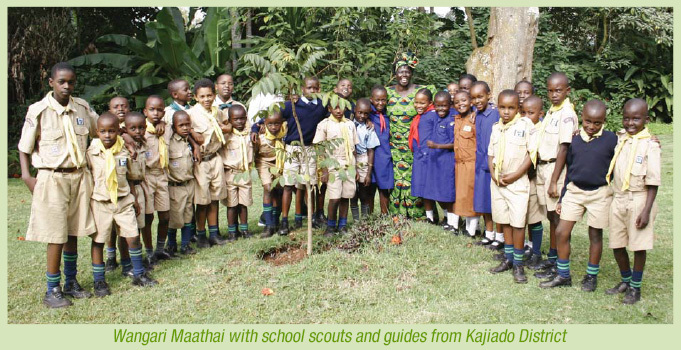 It has planted 30 million trees throughout Kenya so far. She won the Nobel Peace Prize in 2004. It was the first time a Kenyan has won a Nobel Prize. Wangari inspires today&apos;s generation to make a change no matter the challenges. Alfred Nobel was born in Stockholm, Sweden, in 1833, the fourth son of Immanuel and Caroline Nobel. Alfred Nobel invented dynamite in 1867. Nobel prizes were made possible by his final will in 1895 and the first award given in 1901. Each year on December 10, the anniversary of his death, the Nobel Prize is handed out in six categories: physics, chemistry, medicine, literature, economics and peace. The awards are given to those who have made the most important discoveries or inventions in their field. Learn more about Bingwa Magazine.